I was shocked to see when was the last time I put an article on this site. I can only apologise and explain that we have been very busy. No excuse really, but we are actually blogging every day, sometimes for us, sometimes for others. So basically we have been driving both our customer's sites and one of our own. Late in 2016, myself and Steve decided that we were going to drive one of our sites as a proof of concept for our ideas, our strategies and for the wider profession. We have always run a site called Hearing Aid Know, which offers independent hearing aid advice for consumers. We had been neglecting the site for some time and we decided that it was about time that we took it seriously again. As we worked out the strategy for Hearing Aid Know, it became very clear to us that we could and should use it as a proof of concept and for experimentation. So we set about proving everything that we have spoken about. We outlined a clear strategy that we were going to follow in order to establish Hearing Aid Know as a go-to site for hearing aid information while aiming for a yearly minimum of a million page views a year within three years. That strategy took effect from November 2016 but really began in earnest in January 2017. While we had aimed to be a million page view site by 2019, we have in fact reached that goal. In January this year, we had increased year on year page views for the month by just under 245%. 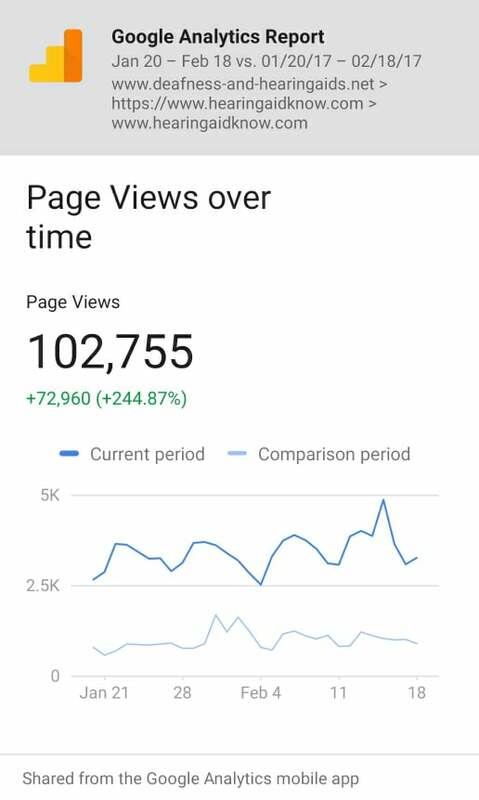 We had 102,702 page views in January 2018. That was, in fact, an increase of just under 73,000 page views compared to the January of the previous year. During this period, it has become clear to us that we have become a perceived authority within the space. More than that, we have become a trusted source of unbiased information. This has led to many conversations with hearing aid users and prospective hearing aid users across the globe. What we have done is, in fact, a little bit harder than growing a locally focused website. We undertook to make Hearing Aid Know a global website. In essence, this meant no local targeting, or in some cases local targeting in disparate continents. Don't worry, sometimes our head hurt too. Suffice to say, that to undertake this type of strategy is a bit difficult. That is the key, Google has, in fact, made everything local, so targeting local is in fact easier. Not just that, it makes more sense for a local business to target locally. We have proved that online effort is rewarded, we also know and have proved that online effort for local audiology practices is both possible and rewarded with business. You need to be investing in your online presence, it will ensure your continued success. In the next few articles, we will talk about the strategy we used for Hearing Aid Know and why we think that it will be one of two sites that will dominate hearing aid searches next year.